With the exponential increase in design rule check (DRC) complexity at advanced nodes, existing DRC solutions haven’t been able to support the turnaround requirements needed to ensure design schedules are met. Current DRC turnaround time takes several days using 64 CPUs, which is the optimal configuration for existing tools. Adding more CPUs does not improve the turnaround time because of the poor scalability of the current tools. At advanced nodes, DRC signoff cannot be run overnight, and even breaking up the deck and running sub-decks in parallel cannot meet the overnight runtime that critical projects need. The Cadence® Pegasus™ Verification System is a cloud-ready physical verification signoff solution, which enables engineers to deliver advanced-node integrated circuits (ICs) to market faster. The groundbreaking technology delivers up to 10X improved performance on DRC runs and reduces turnaround time from days to hours. The Pegasus system’s innovative architecture and native cloud processing provides an elastic and flexible computing environment. Customers can now achieve complete full-chip signoff DRC on advanced-node designs in a matter of hours, helping designers deliver products to market faster, or easily run multiple DRC signoff iterations, if needed, at the time of tapeout. The Pegasus system provides a massively parallel architecture. It is the first solution to combine a pipelined infrastructure with stream processing delivering near-linear scalability across 100s of CPUs. 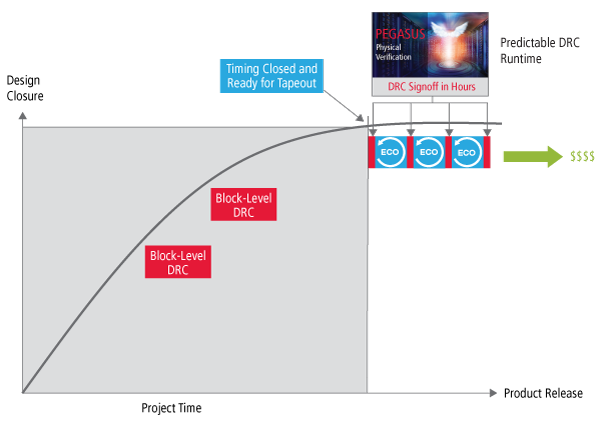 The Pegasus system’s gigascale technology enables full-chip signoff DRC in just a few hours versus days. As many designs continue to grow in complexity, the Pegasus system can scale to meet customers’ stringent time-to-market requirements.